2750 RPM @ 24V 11.5A. Approximate 4" Diameter, 3" Wide, 4" Wide including Shaft, HTD 5M15 Pitch/width belt hub or 11 tooth #25 chain sprocket choice. For all scooters in the 150-200 watt range. Uses the common 4 tap hole flange - Mount Picture. This motor is rated at 2750 RPM, 24 Volt, 11 amps. 4 pounds. 250 watt, 24 volt, 10.5 amp, 2650 RPM. Comes complete with sprocket and bracket attached with four hole tapped mount. This item will fit in most other name brand scooters and X-treme X11 or X250 and Razor. 4 tap hole flange - Mount Picture. Approximate Dimensions: 4" Diameter x 3 1/4" Long, 4 1/2 long including shaft. 4 pounds. 500 watt, 24 volt, 27.5 amp, 2750 RPM. 4.375" Diameter, 5.75" Wide, 6.75" Wide including Shaft. Comes complete with 11 tooth sprocket for #25 chain. This item will fit in most other name brand scooters that have a similar size chain drive motor installed. Available with or without mounting bracket. The 500 watt, 36 volt motor is rated at 18.3 amp, 2500 RPM (windings can safely be reduced to increase RPM). 4.25" Diameter, 5.5" Wide, 6.5" Wide including Shaft. Comes complete with sprocket for #25 chain. 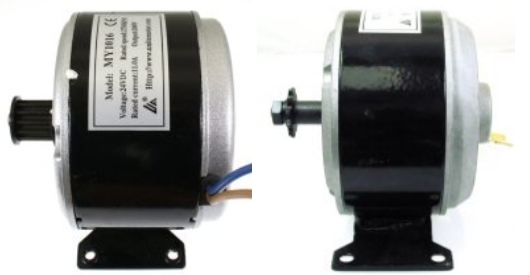 The OEM 500 watt 48 volt motor is 4.25" Diameter, 5.5" Wide, 6.5" Wide including Shaft. Comes complete with sprocket for #25 chain. A powerful motor with low amps at 48 volts. Used in the X-500 X-treme Scooter. 15 pounds. These band mounted motors will fit in most other name brand scooters that have a similar size chain drive motor installed. 24V 750W Motor, Rated Speed: 2600R/MIN, Rated Current: 28 AMP, 11 Tooth #25/25H Sprocket, Shaft Diameter: 10mm, 2-pin male Plug, Wire Length: 26 inches, Outer Diameter (motor): 101mm or 4 inches, Overall Length (including shaft): 109mm. Model: XYD-6B as used on Currie Scooters and other makes and models with flange or band mount. 2800 rpm, 27 amp, permanent magnet motor, 12 guage motor leads, 11 tooth sprocket for #25 chain. Dimensions: 4-1/4" W x 5-1/2" L not including shaft. 4-1/2" W x 6-1/2" L including shaft. Band Mounted Motor where the band is mounted to the frame of the scooter; also has two tapped holes for bolting on each end. ADD $10 TO ORDER THIS MOTOR WITH ATTACHED MOUNTING BRACKET using the ADD TO CART BUTTON below. 36 Volt, 1000 Watt, 3000 RPM, 35 Amp, permanent-magnet motor. 12 gauge power leads. Dimensions: 4-1/4'' W x 6'' L not including shaft. 4-1/4'' W x 7'' L including shaft. Shaft is 15/32 diameter. Sprocket included is for 8mm T8F chain. Order #25 chain double D motor sprocket here. 11 pounds. Also available with attached mounting bracket for $10. Mounting bracket measures 4-3/4'' x 2-7/8'' with 4 mounting holes. Mounting holes 4'' center to center across and 2-1/4'' center to center across. 48 Volt, 1000 Watt, 3000 RPM, 27 Amp, permanent-magnet motor. 12 gauge power leads. MY1020. Dimensions: 4-1/4'' W x 6'' L not including shaft. 4-1/4'' W x 7'' L including shaft. Shaft is 15/32 diameter. Sprocket included is for 8mm T8F chain. Order #25 chain double D motor sprocket here. 11 pounds. Also available with attached mounting bracket for $10. Mounting bracket measures 4-3/4'' x 2-7/8'' with 4 mounting holes. Mounting holes 4'' center to center across and 2-1/4'' center to center across. 750w rear motor-wheel assembly for full-size, 48v electric scooters. 750 watt rear hub motor assembly. Includes wheel rim, hub motor and wiring. Specifications: Tire size 3.00 - 10, 5 Pin Connector, 3 single pin wires blue, green, yellow. Supported Models - Various unlisted makes/models like Panterra (Freedom electric), Panterra (Fusion electric), Panterra (Retro Electric), X-Treme. 30 pounds. OEM 50cc engine that may be used for a large variety of scooter applications. Engines are brand new and not refundable or returnable. Transmission sold separately or purchase engine and transmission together and save! OEM X-treme. Electric start with additional pull start. Transmission includes snap/keeper ring. Centrifugal Clutch built inside transmission. This item fits many other brands of scooters. Engines are brand new and not refundable or returnable. OEM X-treme. 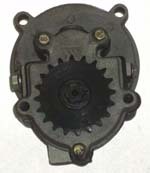 Transmission For XG-499/XG-505/XG-550 with attachment retaining clip. Centrifugal Clutch built inside. This item fits many other brands of scooters. Metal Upgraded, higher quality, pull starter reduces wear and breakage for 33 - 50cc engines. Starter pawl parts for 33 - 50cc engines. Most common types! We began selling tested parts at a discount, or wholesale scooter parts, to valued customers who are primarily repairing customer scooters. Testing each part is necessary to insure parts work properly, saving the need for time and money wasting returns. With our quality tested parts repair shops were quickly able to repair their own customers scooters, receiving the parts in a few days at a decent price. Our prices are lower for tested parts and scooters, and we may still be the only ones testing what we sell, including the motors sold on this page from our warehouse.